In the world of packaging machinery, flexibility and performance is the goal -- while designing a machine that requires minimum space. Decreasing downtime is also critical to increasing productivity and delivery. As packaging machines become more complex and interconnected, there is a need for both standard and custom solutions. Moog's engineering experts have designed a vast array of brushless DC motors and Ethernet slip rings to address these issues. Moog’s high performance motors meet the robust requirements of packaging applications. For example, our Silencer® Series brushless DC motors provide the advantages of robust operation, high efficiency, low weight and high reliability. These compact motors are rated for operation in extreme environments with ratings of IP65 and IP66 (for washdown applications). 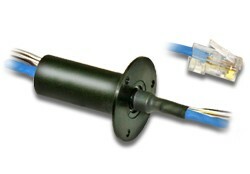 Moog's industrial slip ring products are based on years of material and design experience. Our Ethernet slip ring solutions have been developed to provide reliable products to allow transfer of the Ethernet protocol through a rotating interface. A wide range of product solutions are offered with combinations of data and power in multiple mechanical configurations to meet the needs of packaging applications.